Camp with us 3 weekends this season, and get a 4th weekend FREE! Pick up your Camping Card when you register for the first weekend. Get it stamped at registration the next two weekends you camp with us. Then present it upon registration for your fourth (non-holiday) weekend ... and stay FREE! Sorry, this offer does not apply to cabins or rental campers. 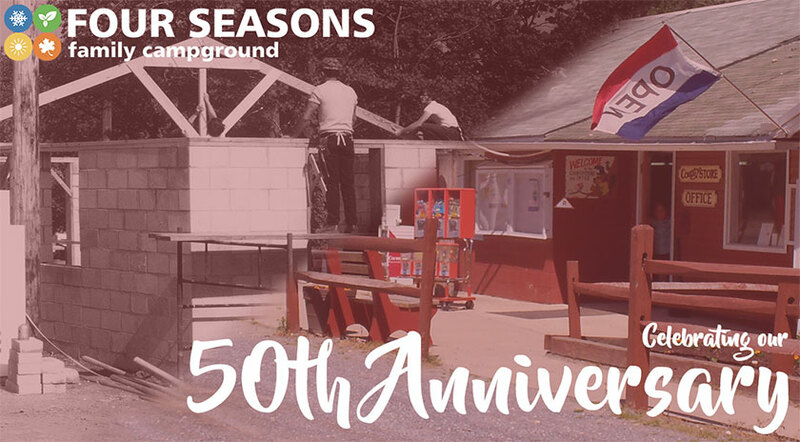 Four Seasons Campground is open all year, located in the Delaware River Region of Southern New Jersey. 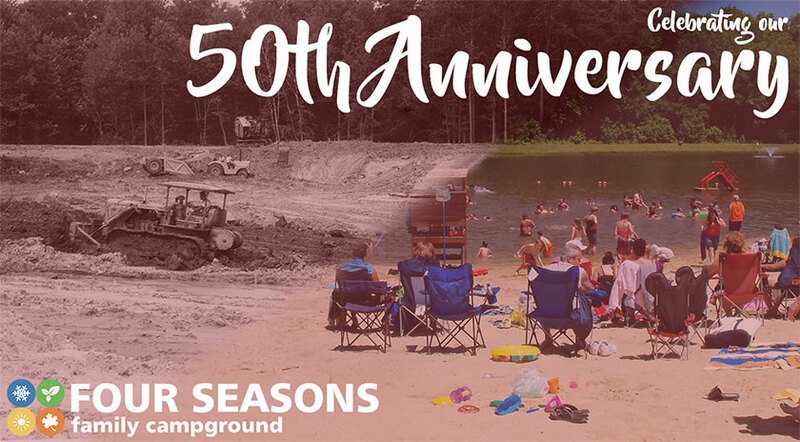 Featuring large open or wooded sites, our park easily accommodates big rigs and offers plenty of activities, located only 30 miles from Philadelphia and 50 miles from Atlantic City. 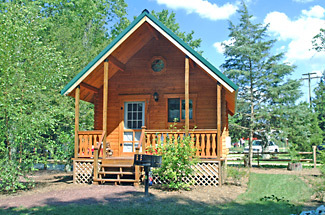 except when you stay in one of our deluxe cabins! Each of these full housekeeping units includes a full bathroom, heat & air conditioning, a kitchenette, and a separate bedroom, along with a long list of additional amenities. Welcome to the best vacation spot in South Jersey! 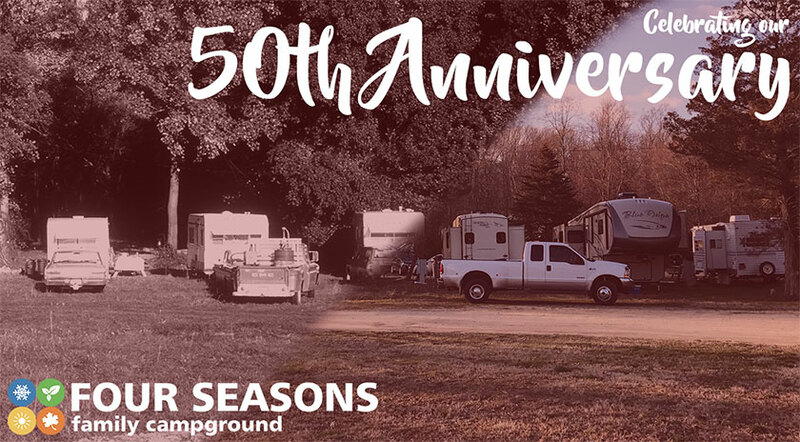 Nestled in a country setting, offering the promise of relaxation and beautiful scenery, Four Seasons Campground has something to offer everyone. Each weekend during the summer has been planned with exciting themes and activities to allow you a choice in how you spend your weekends. Whether you want to do a little or a lot, we are here to make your vacation, your vacation! The Activity Program Guide is your tool for planning your ideal summer. Each month has a brief summary of themes that we know you won’t want to miss! We have plenty of your favorite weekends, but be on the look-out, we have added several NEW themed weekends you will not want to miss. You will be able to find more detailed information on upcoming weekends each week on our Facebook page and in our “Weekend Program Flyer” every Friday in the Camp Store. We look forward to seeing you and can’t wait to show you a great 2019! Camp with us 3 weekends this season, and get a 4th weekend FREE! Pick up your Camping Card when you register for the first weekend. Get it stamped at registration the next two weekends you camp with us. Then present it upon registration for your fourth (non-holiday) weekend ... and stay FREE! Sorry, this offer does not apply to cabins. © Four Seasons Family Campground. All rights reserved.